The dust has barely settled in Indian Wells but the Sunshine Double waits for no man and the Miami Open draw has just taken place at the Hard Rock Stadium in Miami Gardens. Roger will be en route to Florida as we speak and the draw has thrown up a likely repeat of last week's third round clash against Stan Wawrinka. You can see Federer's projected opponents below. I feel good, I'm healthy, that is also like a victory, a lot of people underestimate this, so I'm happy. I will fly to Miami on Monday, could use some humidity my skin is extremely dry! After the standard bye, Roger will face either Matthew Ebden or Radu Albot in the first round. The Moldovan came through qualifying and he's a great last few weeks winning the Delray Beach tournament. At least it's not Kokkinakis this year though which can only be a good thing 😀 but I do expect Albot to come through and he's a solid player winning 4 matches over at Indian Wells where he again came through qualifying. No huge weapons but a test for Roger. Round three could then be a repeat of Indian Wells with Wawrinka as the seeded opponent. Stan has a bye this time and will face either Pierre-Hugues Herbert or Filip Krajinović in the second round. The Serbian will likely come through that as he looked in pretty good form in the Coachella Valley last week before running into Nadal. Should Roger play Stan I'd expect it to be closer than the match in Indian Wells but still pick Roger to come through. Statistically, Miami is Wawrinka's worst Masters 1000 for % of match wins but a new venue does reset things slightly. Round four sees Medvedev as the projected opponent. The Russian is coming in off a bit of a surprise loss to Krajinovic in Indian Wells and his section is quite open with Schwartzman, Mannarino and Struff all capable of making it to the last 16. I think the Argentine might come through and that could be an interesting match should Roger make it. Fed leads the H2H 4-0 but diminutive Diego is a tough competitor and should like the conditions. The quarter-final has Kevin Anderson as the top seed but after he withdrew from Indian Wells I have no idea where he's at game wise. The South African usually plays well in Miami given he's based just up the coast at Gulf Stream but a lack of match practice doesn't help his cause. Dimitrov is in this section too after also missing Indian Wells with a shoulder problem and so is Khachanov who finally found some form last week after a woeful start to the season. I'd pick Karen to come through here and like Thiem he has the firepower to hurt Roger should they meet. The semi-final has third seed Sascha Zverev as the projected opponent but he's been up and down of late. Bombing in Australia, making the final in Mexico then struggling with illness in Indian Wells. However, I think the German will play well in Miami. He was last years runner up, spends the offseason at the Saddlebrook Resort in Tampa and the conditions suit his game style so he should be able to put another run together. The final, of course, has Djokovic as the top seed and he's already at the venue practicing. The Serb should be fresh after losing early in Indian Wells and he's usually tough to beat here. Isner, Thiem and Nishikori are all in his half though so assuming the draw keeps some semblance of how it looks on paper he won't go untested should he make the final. So overall tricky to predict with the venue change here and I imagine the projections will all fall by the wayside in a few day times. How different will the conditions be? 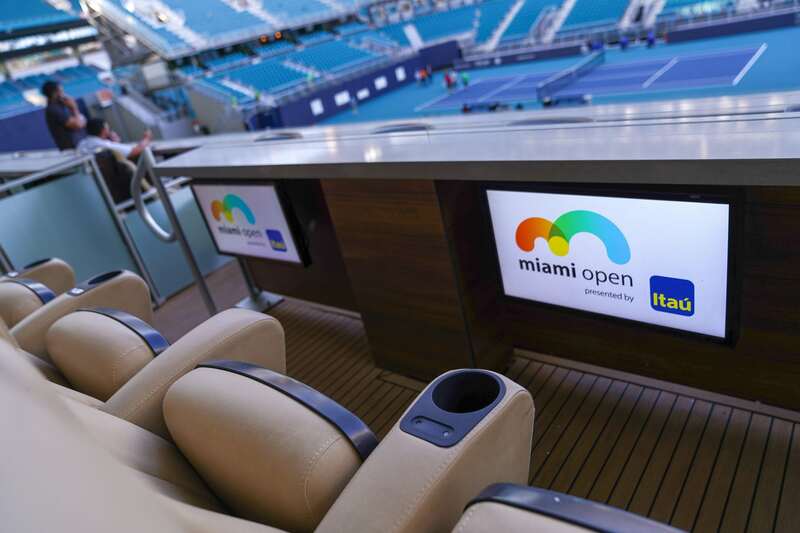 It's still Laykold Plus and it's still in Miami but a completely new arena and the court will be laid differently to how it was at Crandon Park so I'm interested to see how it plays. I'm also looking forward to seeing how the tournament is received by the players and fans. Miami has historically been one of my least favourite events in the Calendar, can it move up the ladder? As for Fed, he lost his first match here last year after losing the Indian Wells final so avoiding a repeat of that is his first MO. From there I think it's just continuing to play how he did in Indian Wells and seeing what happens in his last tournament before his clay comeback in Madrid. As always let me know your thoughts on the draw in the comments. Are you looking forward to the new venue? The draw doesn’t look bad. I hope he’ll do better than last year and it would be great if he wins it ;). However the draw could fall apart as at IW.Interesting to see how the new courts play. I think the draw looks pretty good, but interested to see which qualifier gets places in there. Hum, not an easy draw but that can also be a good thing. I can’t help thinking that if Roger had had a “normal” semi-final match in the Deep Desert Wells he might have played more sharply in the final. But that’s milk that has long flowed under that bridge and turned into yogurt somewhere else. American Open,when Djokovic got a ridiculously easy draw with walk overs and players retiring injured and then ran slap bang into Stanimal in the final.So yes the tougher draw can be good,sometimes,the best example of all being Feds draw at the Ausralian Open after six months off. Daunting draw. Good challenge for the FedExpress. Indeed,and don’t forget that the World number 1 and 2 were included in that 126,also number 3 if I think about it. Roger is enjoying his tennis year 2019. He knows he is 37 and soon to be 38 this year and having fun with his game. If he is going to play clay it shows me he is just enjoying playing and that the “MUST WIN AT ALL COST” is gone. I believe Merka and his team support his decision to keep playing because even if he does not win another tournament this year if he stays in the top 10 at age 38 that also would be an accomplishment. I think he keeps playing and fighting to stay in the top 10 and that means maybe another 2 years when he turns 40. So let us keep supporting our great champion and win or lose judge him for his great tennis at age 37. Jonathan I agree with your thesis. Let him see how far he gets in this tournament without high expectations and with the forethought that regardless of the outcome, the match play will help him for clay. A haunting draw! Let’s see what Roger can do with this lot. He feels healthy and happy, so what else. quicker than IW not only for Fed but for all players. In terms of CPR it’s quicker usually but through the air prob not. You describe Miami as one of your least favourite tournaments.Just wondering why that is so? Just never enjoyed watching it a whole lot for some reason. Obviously enjoyed 2017 but other than that can’t recall really getting into it. The venue, fans, Miami, IMG etc. I met people in the airport at Palm Springs. They live in Florida and prefer to go to IW. I see it’s in an Industrial Park now and built on a parking lot. Yuck. After being at Melbourne Park and USO, I tell ya, things look a whole lot better on tv. I still can’t get over the fact that a clay-courter won Indian Wells and then we go to another hard-clay court. Fed might not win this one but he should get as much points as he could for Wimbledon. My only hope is for Djokovic to lose again and another Isner-like player wins it again with all the inspiring backstory. That’s the only feel-good outcome other than the GOAT Federer winning it. Could be another different title winner with how the season has gone so far. I think he can at least make the semis if he remains in good form. Medvedev would be tricky and Zverev would have a good chance at taking him out if his head is right. Overall I just hope to see the same way he played in IW – holding serve well, hitting the forehand with authority, and returning more aggressively. Is Medvedev any good on slower hard courts? Loads of banana peel, on paper he should be able to navigate through it till semis at least. I hope for better result than last year. It will be interesting to hear what Roger has to say about the court condition. Yeah he practised on the main court yesterday. I’ve not seen any talk of the speed yet but not been on twitter much. Yeah but yet another tough draw for him with Fed in R3. Guess Stan will be looking to rack up some points on clay. Decent draw. Can’t expect anything easier in a 1000. He has a chance to win it since he is healthy and playing well. If he can just play the important points with better mindset and get luckier than he has been of late, …. I’d be surprised if he won Miami as I think IW suits him more but we shall see. The stadium looks great with a nice shade of blue just as the sea of Côte d’Azur. Though, heard the court speed was medium slow. Well another good practice for clay season. I think will be the same outfits(s) from IW. Then new for clay. A few quick thoughts then. – Sad Fed lost the 101-Dalmatian final but happy for Dominic who played better. I had seen a video about Thiem’s training during the winter at Teneriffa. It was impressive ! Glad that huge work paid. I wish Nadal had solid opponents at RG this year ! – Fed just won an ATP 500 and was the finalist of an an ATP 1000 in a fortnight. He played beautiful games. What a treat to enjoy to forget about Chistchurch tragedy, Paris riots and the like ! – I wish pupils, students, every of us could display such a nice attitude and happy smile after a failure or a defeat (trophy ceremony)… what a lesson ! It shows the most sincere feelings from Roger towards Thiem. I guess he is deeply happy his Laver cup team-mate won his first Masters 1000 at 25. – As for the Miami draw : it seems challenging but RF is healthy as he said, he knows his opponents well, will love to compete in a new stadium… all positives. If IW was a five-set final would prob have gone 5 I think. I agree about the class and warm feelings towards Thiem (one of his numerous young students). Thiem is still shy and not prepared mentally to have a speech as a winner of a big tournament and this just against Fed. Thiem’s speech (I cannot catch everything when hearing live in English) was a bit funny. He was happy, genuine, humble and respectful and completely embarassed to be in this situation . Roger was staying relaxed and chatting with Tommy but when Thiem started to “battle” through his speech, Fed was trying to friendly help him and there was a moment, I believe to have seen his eyes getting wet and he looked really moved by Thiem’s happiness, expressed with so much humbleness and respect. Thiem is in good memories from the first Laver Cup (the pic Jonathan chose for the article was just perfect. I think Fed was genuinely a happy loser. The one, having won everything, helping the youngster just coming through the situation of having defeated the GOAT in an even, close fight. What can be more delightful for the MAESTRO than seeing his STUDENTS making big progress and understanding, every young player on tour must less or more feel his apprentice? Yeah beat Sascha in the final, was a great win for him. Don’t know anything about booking tickets for RG but wonder if they are as difficult as booking for Wimbledon? Many years ago my husband just wandered into Roland Garros and could buy tickets there and then. But I imagine those happy days are no more! For 2 of 3 years, you cannot buy RG tickets so easily (within or near the stadium) : you have to “queue” on their website and tickets are nominative (to avoid black market). You cannot give/sell your ticket to a family member or friend for that reason. If you need to resell your ticket because you cannot go on a given day, you can do it on the website and you will be refunded via a money transfer within a few weeks. Thus, if you have a chance you can try and buy a new ticket a few days before a given day according to the few tickets which have been resold. A few weeks ago, part of the tickets have been already sold to tennis club members. So, the rest of the public will be able to buy the remaining tickets as of today… Fingers crossed ! I want to see Roger play ! Butterfly – could you join a tennis club as a non-playing member and get access? Yupeeee ! I managed to buy seats on the Central Court of Roland Garros for 2 consecutive days – 2nd round on May 29 + 30. Seats are in the high rows but I’ll cope with it. – Roger to win first round. I came back to the site at lunch time. Almost all tickets have been sold (except premiums). Federer effect ? Crazy !!! Federer vs Albot first round. Never in doubt he’d beat Ebden.